We distinguish ourselves from other accounting firms with our caring, client-focused approach and our comprehensive service. We are licensed, certified and experienced to help our clients with their financial decisions or transactions. We understand that you have options when it comes to your finances, but no one can offer you a more complete financial analysis or comprehensive strategy than us. Also, unlike other institutions trying sell their own investments and financial products, we are an independent advisor dedicated to you. Make us your first call and let us earn our reputation with you. Whether you are a small business, a medium-sized business or an individual, there are many situations where the right advice is critical, helping both to avoid mistakes and prevent missing opportunities. 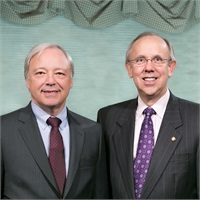 Investment and financial planning services are offered by Donald P. Kostka and John Taylor, Jr. through their affiliation with HD Vest.